An aspirating smoke detector is a system used in active fire protection, consisting of a central detection unit which draws air through a network of pipes to detect smoke. 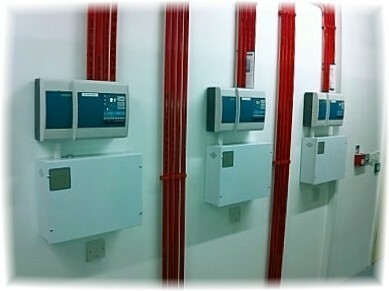 Aspirating type smoke detection Panel which deliver highly accurate and Very Early Warning Fire Detection over a wide coverage area and also offer extensive communication capabilities. Established in the year 2013, We “Addon Technology” are extensively acclaimed by the clients for supplying & installation a wide gamut of CCTV Surveillance Camera, Fire Alarm System, Intrusion Alarm System, Security Mirror, Audio Video Door System, Metal Detector, Speed Breaker and many more. Procured from the known/reliable vendors of the industry, the provided products are made available in variegated technical specifications. These products are manufactured by making efficient use of quality tested components with the assistance of cutting-edge technology at our vendors’ end. Our offered products are designed in conformance with the set quality parameters as these are staggeringly monitored on the terms of quality, construction and long functional life. These products are broadly appraised for their salient features such as user-friendly operation, outstanding quality and economical prices.